Posted on January 6, 2016 at 3:48 pm. 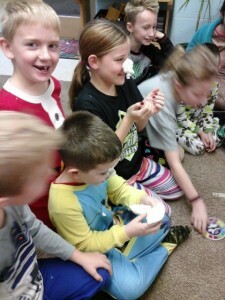 The month of December has been full of fun and merriment in our classroom! The children have enjoyed learning about the weather, the different parts of the orchestra, and about different symbols of the holiday season. We had a blast! 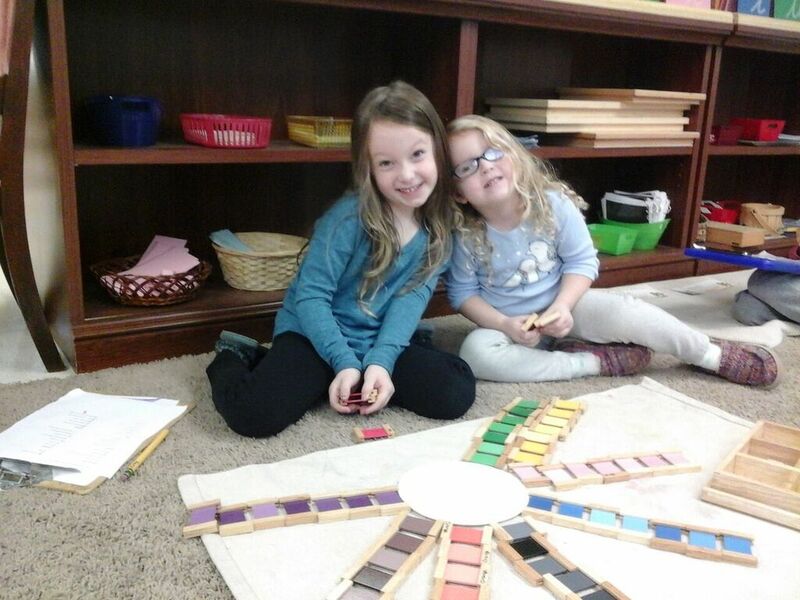 During the first week of December, we learned about weather. The children enjoyed talking about the job of a meteorologist how it is their job to scientifically predict the weather. Ms. Kim and I also had the children keep track of how many sunny, cloudy, rainy, and snowy days there were that week. Sunny days actually won out for a change! We did not expect that in the month of December! 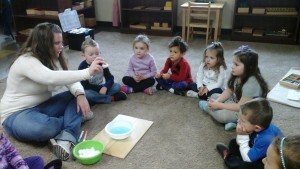 Ms. Kim also conducted an experiment with the children about how clouds are formed and why it rains, using cotton balls. 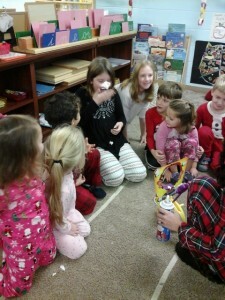 During the second week in December, the children learned about the different parts of the orchestra. They learned that all instruments belong to a “family”, such as String, Woodwind, Brass, and Percussion. The children also enjoyed listening to sound clips of the different instruments in our parts of the orchestra work, and placing the cards in each family of instruments from the highest sounding instrument to the lowest sounding instrument. 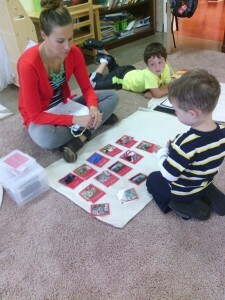 The children also enjoyed making a book of all of the instrument families as well with Ms. Kim during Pre-school Lesson. I even brought in some instruments for the children too look at and identify such as a ukulele, a recorder, and a xylophone. The children also enjoyed listening to the music of Bach as well while playing the Silence Game. 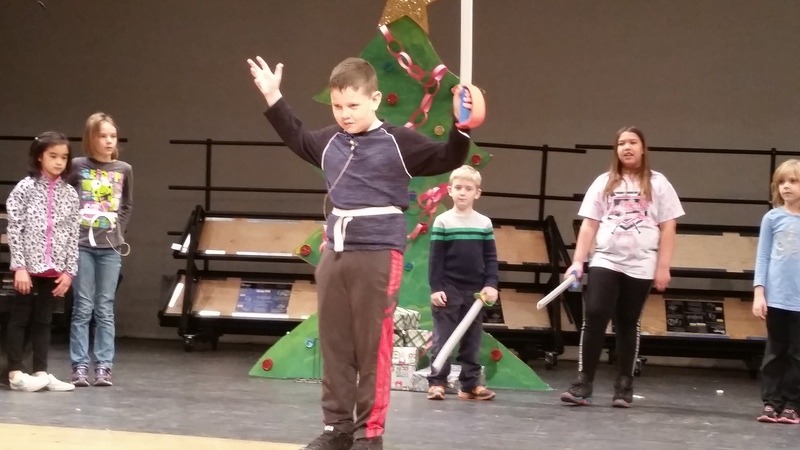 During week three of December, we focused on preparing for the Christmas Show. We also made candy cane ornaments with Ms. Kim. The children also enjoyed making Christmas Sugar Cookies during our afternoon group time. 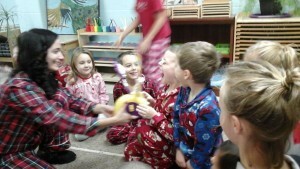 Pajama Day was also a blast, and the children loved wearing their p.j.’s and watching movies! It was a well deserved rest after all of their hard work so far this year! Children love animals and I enjoy teaching the children about different types of animals. This month we started discussing mammals. I chose mammals because we are mammals. We learned that mammals have hair or fur, are born alive, and drink mother’s milk when first born. We learned that mammals are warm blooded (their body temperature remains constant) and that they are vertebrates (have spines). We learned that dolphins and whales are mammals and that the bat is the only mammal that can fly.Then we slithered our way into discussing reptiles. We came to the conclusion that the snake is the most popular reptile. We learned reptiles are cold blooded, vertebrates, lay hard shelled eggs, and have dry scales. Lizards, snakes, and turtles topped the list of reptiles. We hopped into our discussion of amphibians. We all agreed that the frog was the most popular amphibian and that amphibians are cold blooded and vertebrates. We also learned that their skin is moist and soft and that they can live on BOTH land and water. Amphibians lay eggs but the eggs have no shell but are like jelly. We found that frogs, toads, and newts were amphibians. We looked at some creepy crawlers that were a bit different. They were invertebrates. we looked at insects which have a head, thorax, abdomen, six legs, and two antennae. Beetles, flies, bees, butterflies, and crickets are all insects. Arachnids are invertebrates but have eight legs, cyphelothorax, and abdomen. Spiders, scorpions, ticks, and mites are all arachnids. 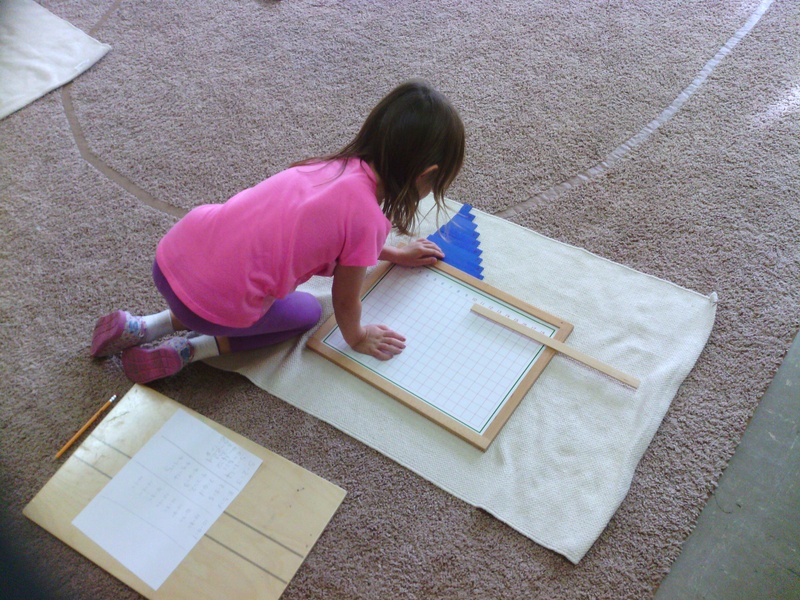 We ended 2015 learning how to use a ruler. The students went home and measured many things in inches and in centimeters. 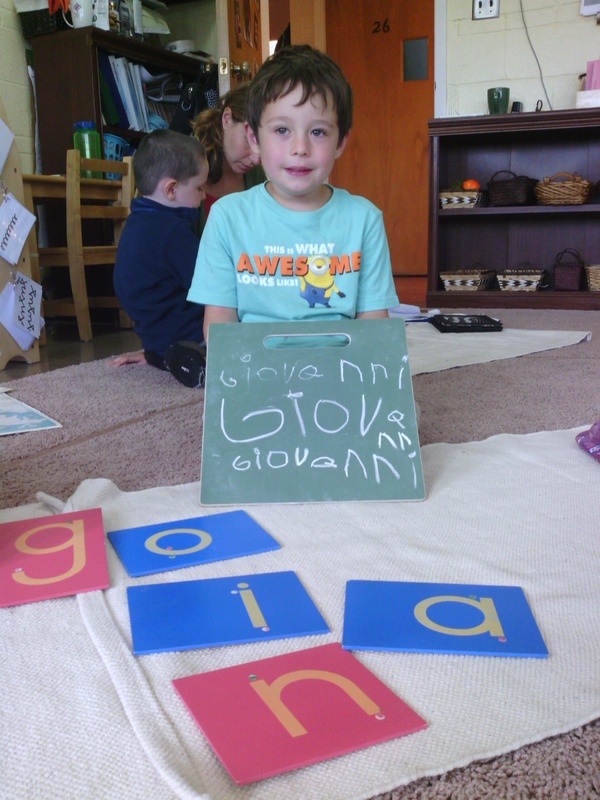 We can now count to ten in 20 different languages. (English, Sign Language, Latin, Spanish, German, French, Greek, Japanese, Arabic with Lebanese dialect, Italian, Russian, Romanian, Swedish, Tagolog, Hebrew, Korean, Hungarian, Irish, Kiswahili, and Welsh). In music this month the students sang hello to Freida the frog and Penny the pony. We had fun singing the Christmas songs of “Feliz Navidad” and “Jingle Bells”. To help get into the Christmas spirit we played bells and castanets. Then we reviewed the musical words for fast, medium, and slow. (allergo, andante, adagio) Lastly Ms. Lisa helped us with our songs for the Christmas show. Our first experiment dealt with sinking and floating. Mr. John showed the children a lemon and a lime. They made hypotheses on which would float and sink. Even though they look almost the same size the lemon sank and the lime floated. The lemon is more dense than the lime. Our next experiment involved peppermint candies on a plate and water. Mr. John asked the children what would happen when water was poured over the candies. Just like the skittles experiment, the dye off the peppermint ran off. The dye is water soluble. 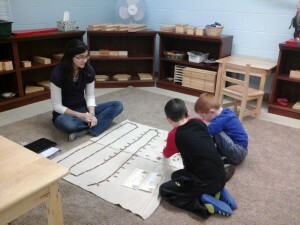 The first week of December, Ms. Michele had the children finish their warm and cool color tile mosaics from last month. 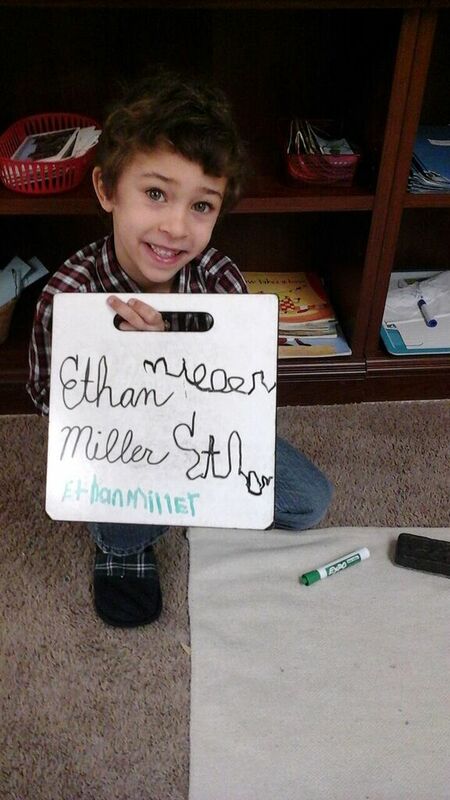 The second week Ms. Michele had the children draw their self-portraits. The children used mirrors and pencils to first draw an oval for their faces. Then they added eyes, nose, mouth, ears and eyebrows. Lastly they added details such as shoulders and hair. I would encourage you to watch the weather report with your child. As a family, track how many sunny, cloudy, rainy, and snowy days there are for a week. 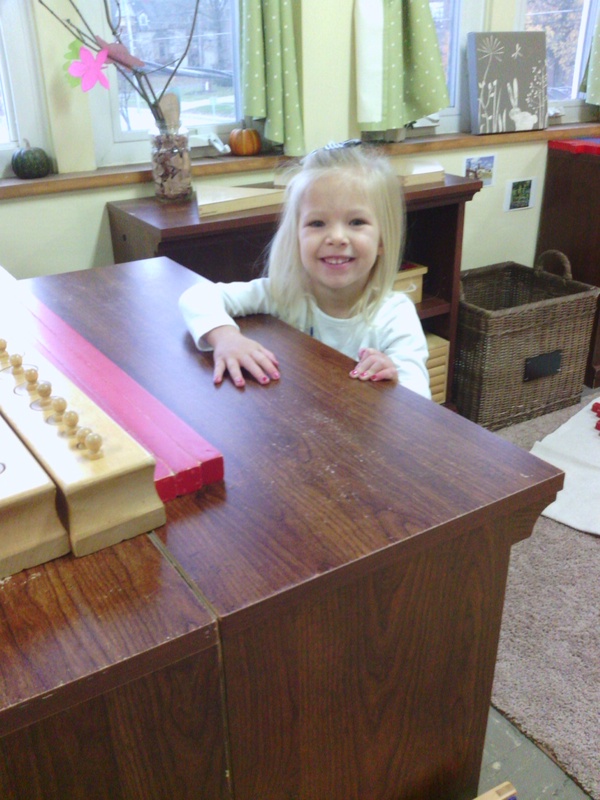 Listen to classical music with your child and discuss the different instruments you hear. Find a cookie resipies to make together as a family. Make your child a part of the preparation, measuring, and baking. 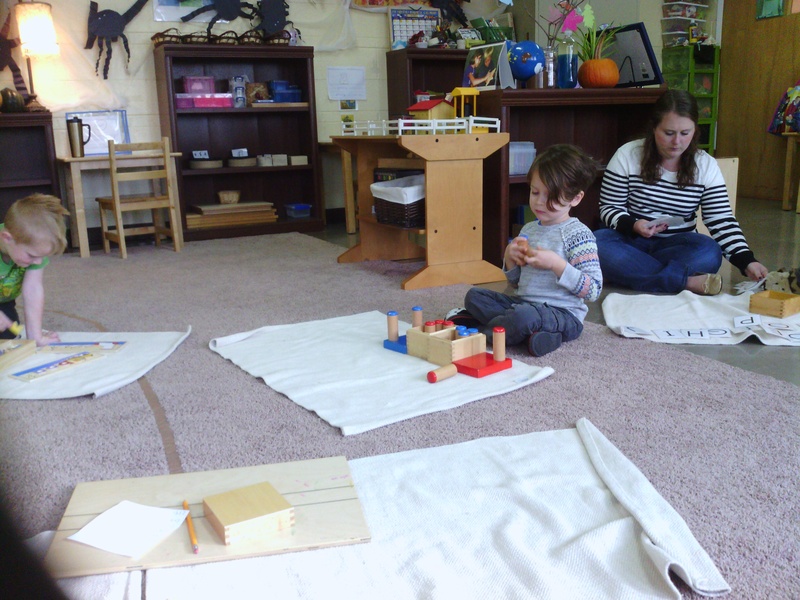 Maria Montessori stated that “ Establishing lasting peace is the work of education; all politics can do is keep us out of war.” As a Montessori Directress, it’s truly been my privilege to watch your children grow and learn through working with the materials in the classroom. Through their interactions with each other, I have enjoyed watching your children form lasting friendships and learn to resolve their own conflicts peacefully. I am so proud of all of their progress so far this year, and I’m looking forward to seeing what the next have of the school year brings! Posted on January 6, 2016 at 3:35 pm. After Thanksgiving break students were excited to get back to work. Several of our older elementary students began researching Ancient Rome and Greece. They set their own deadlines and dove into their work. They drew maps of the empires, clothing, and made lists of all the famous gods and goddesses. It was amazing to watch them wonder through history exploring the things that stood out the them and were the most interesting in their minds. I was even more impressed with their work ethic throughout the research. Nothing was assigned, but every topic was covered and they all worked together to complete their work. I am excited to hear their presentation when we return from break. Other students were looking into their personal family history by creating a timeline of the family members living in their houses. They also explored the Story of Numbers and Story of Writing. These are two of the Montessori Great Lessons discussed in elementary each year. 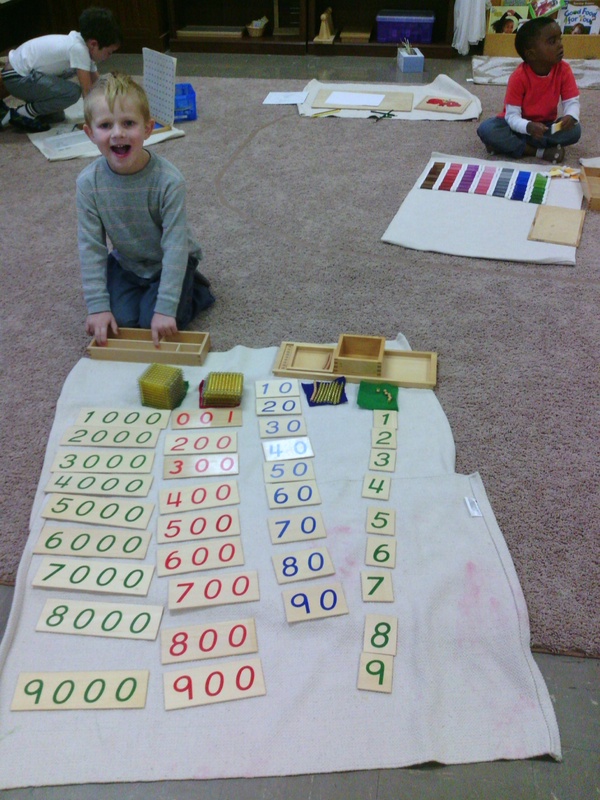 We talk about how writing and numbers came to be and how they have changed over time to better serve the needs of humans as we learn and grow. 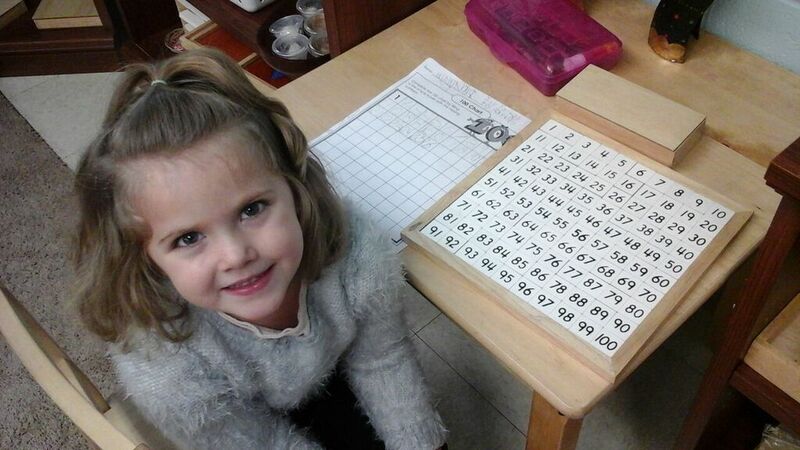 We look at visual timelines, charts, and examples of various styles of writing and numbers. The kids love to see how other people used to write and how it is similar or different from how they write today. Of course, with Christmas approaching we spent time preparing for our annual Christmas Show. This year the students voted to perform the play, The Nutcracker. Parts were chosen and everyone worked diligently to learn their lines. We read several versions of the book, watched the Disney version of the story, and some students even went to see the ballet with their families. I was very impressed with how well each student learned their part, memorized their lines, and helped each other perform well. I think their favorite part was creating all of the props. The students designed what we needed based upon the script, and went to work! 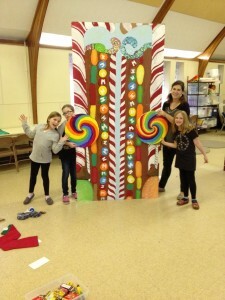 They cut out a fireplace, mantle, Christmas tree, and made a beautiful candy gate. They added flair with colorful painting and three-dimensional decorations. Our play was a wonderful success. I was so proud of the students! 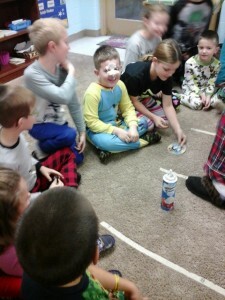 To kick off our break students came to school in their pajamas (so did the teachers) and had a blast playing games and watching Christmas movies. This is such a fun day for everyone! The highlight was joining Ms. Courtney’s class to play Pie in the Face. Posted on January 6, 2016 at 3:30 pm. 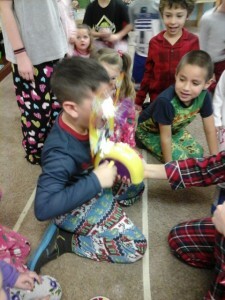 December was filled with many fun winter and Christmas activities. We started the month off with focusing on practicing our songs for the Christmas program. The students worked very hard to memorize the lyrics and to get the motions down just right. Our students created candy canes out of their fingerprints. We also made Rudolf pictures by tracing the students’ hands for the antlers and feet for the face. Next, we added a red nose and eyes to complete the reindeer. The students also made a winter scene snow globe out of paper plates and sandwich bags. The students loved making Christmas tree ornaments out of sticks and ribbons and melted snowmen ornaments to put in their gift bags to parents. We all enjoyed the students’ show and tell items and they enjoyed sharing with the class. The children especially had fun wearing their pajamas to school and watching classic Christmas movies like The Grinch, Frosty, and Rudolph. The kids did an amazing job at the Christmas program and were the cutest misfit toys! The kindergarteners worked hard on their journals and have no learned how to measure in inches and centimeters using a ruler and tape measure. They have been measuring many different objects in the classroom including their teachers and recording it. They also enjoyed the holiday season by making many holiday treats to share with their friends like rice krispy treats and sugar cookies. We did a blubber science experiment by putting Crisco between two plastics bags, then putting our hand in and into freezing cold water. We learned the animals of the Arctic and Antarctic circles spend their lives surviving subfreezing air temperatures and frigid water. Their secret is blubber, a thick layer of body fat that comprises up to 50% of some marine mammals. The students were amazed at how different the water felt with and without the blubber glove. The best way to spread Christmas cheer is singing loud for all to hear, and sing, we did! This month in music class we spent a little bit of time perfecting our songs for the Program, but after doing great work, we need some time to have fun and dance! We sang and danced with Ms. Lisa to songs such as Feliz Navidad, Dashing through the Snow, and Jingle Bells. She also brought her castinets, jingle bells, and other fun instruments to play as a band! We had a great time together playing and preparing with Ms. Lisa, and we hope you enjoyed our performance! Have a very Merry Christmas and a Happy New Year! December marked the start of our figure drawing unit. We started the month off with creating foil figures and cutting shadows out of black paper for them. The next week, we got into the Christmas spirit by drawing ourselves as elfs working in Santa’s workshop. It was a short month for art, but it was filled with fun and excitement as we prepared for our Christmas Program! Posted on January 5, 2016 at 2:55 pm. 1/11: History of Martin Luther King Jr. While reading to your child have him/her pick out the sight word “am.” Go outside in the snow, fill a spray bottle with food coloring and water. have your child spray out the letters and sight words we have been talking about all month. also your child can create an Alaska theme using seals, polar bears, walruses, and penguins. Posted on January 5, 2016 at 2:52 pm. Are good friends considered family? Posted on January 5, 2016 at 2:45 pm. Posted on January 5, 2016 at 2:43 pm. You may also google the name of the work to find more videos and information on the purpose of that material. Posted on January 5, 2016 at 2:37 pm. The children will be making their own snow. The children will talk about ice fishing and then do some ice fishing in the classroom. The children will experience what it is like to be a penguin. The children will learn about all of the different polar animals. The children will learn about the ocean habitat. The children will compare their length to a blue whales length. The children will create waves in a bottle. The children will learn what a hero is. The children will create a classroom “I Have A Dream Book”. The children will learn that even though everyone is different on the outside, we are all the same on the inside, through an egg experiment. Learning about different animals we find at the Zoo. On Friday 1/29 each child is invited to bring their favorite stuffed animal. The animal should be one commonly found in a zoo. 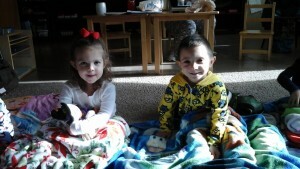 They can have snack or lunch picnic style with their stuffed animal. The children will create zoo cookies. Try and spot all the different animals outside during winter. Have a birthday party for M L King. Talk to your child about what his/her dream is and share yours. Posted on January 5, 2016 at 2:34 pm. -Care of The Environment-Rolling a rug, tucking in a chair, etc. -Grace and Courtesy-How to greet another, how to get a friends attention, how to say please and thank you, etc. 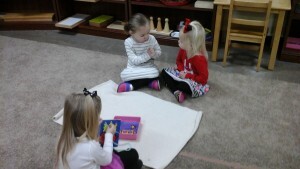 -Friendship Game- The children will guess who’s voice they hear to practice listening. 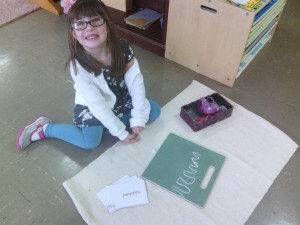 -Reviewing kind words and phrases. -Maria Montessori-Her life, mission, and how she was a peacemaker. -Mother Theresa- Her life, mission, and how she was a peacemaker. -Martin Luther King-His life, mission, and how he was a peacemaker. -Discussing how we are also able to be peacemakers. -Learning about the food pyramid. 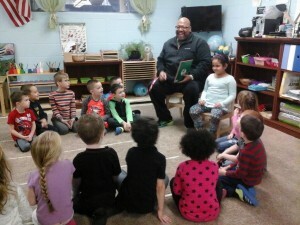 -Learning about foods that are beneficial for our bodies and what is “ junk food”. -Learning about the differences between fruits and vegetables. -Making a healthy snack as a class. -Singing songs that reinforce healthy food choices. -Learning about our sense of hearing and about the different parts of the ear. -Learning about our sense of taste and the different parts of the tongue. -Learning about our sense of touch. -Learning about our sense of smell. Discussing how our nose functions. -Find and health rescipie to make together as a family. -Discuss with your child who their favorite peace maker is that they learned about in class. Discuss with your child how they can be a peace maker at home. -Include your child in household chores. Allow them to take part in taking care of their home environment. Posted on December 7, 2015 at 3:34 pm. Wow! I can’t believe how fast time is flying by! The children have been working really hard this month learning about the different types of clouds, weather, order of the rainbow, five food groups, healthy habits, dinosaurs, and all about the first Thanksgiving. 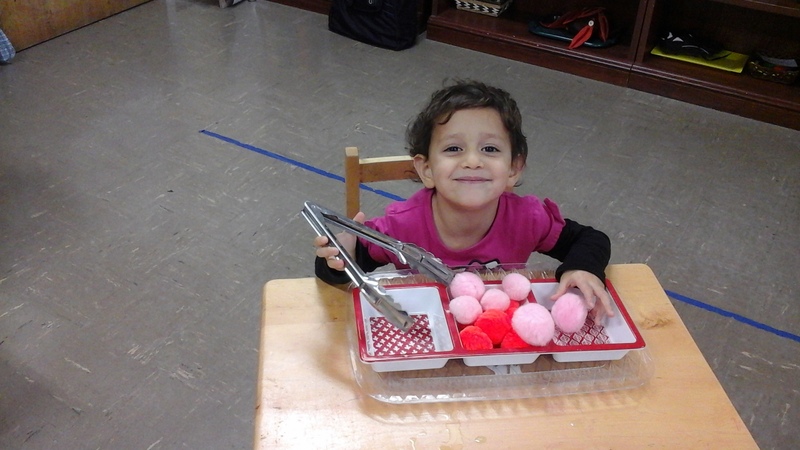 The children also had a lot of fun creating and preparing for our annual Thanksgiving feast! During the first week, the children learned about the different types of clouds that we see such as cumulus, stratus, cirrus, and cumulonimbus. The children were able to look out the window everyday and talk about what clouds they saw that day. It was such a great lesson because the children really enjoyed learning about what they saw! Throughout that week we discussed the different types of weather we have here in Ohio and across our nation. During line time we learned about how a tornado is formed, what happens when other states have hurricanes, and how much snow you can get in a blizzard! The children also learned how rain and snow are formed inside the clouds, that strong winds are called gusts and that light winds are called breezes. The last day we read a great book about rainbows. The children learned how a rainbow is created and the color order, ROYGBIV! Wow, we had such a busy week! The second week the children focused on nutrition. 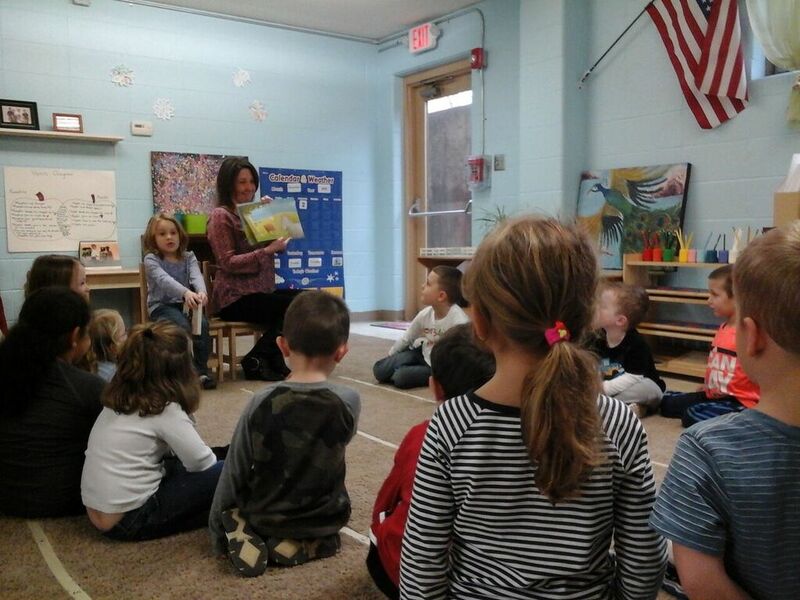 The first few days we read books that had to do with healthy habits. We discussed the different ways to keep our body healthy and we charted them. I then posted a food pyramid on the wall and explained what each section was about. The children then were given different food pictures and were able to post the pictures in the right section of the food pyramid. 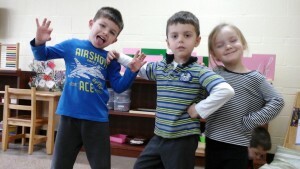 The next day we did a fun activity that taught them about how we spread germs and about hand washing. I started out by sneezing glitter into my hands and showing the children what your hand looks likes when you sneeze into it. I then shook the child’s hand that was next to mine and had them show the class what his hand looked like after he shook my hand when I didn’t wash them. That child then shook his neighbors hands and this continued throughout the circle. The children couldn’t believe how just by me not washing my hands how I passed so many germs to so many people. We then practiced washing our hands by singing the alphabet song! The last day we talked about the importance of exercise and how much our body needs everyday. I then showed them different pictures of people doing different exercises and the children had to act out the picture I showed them! 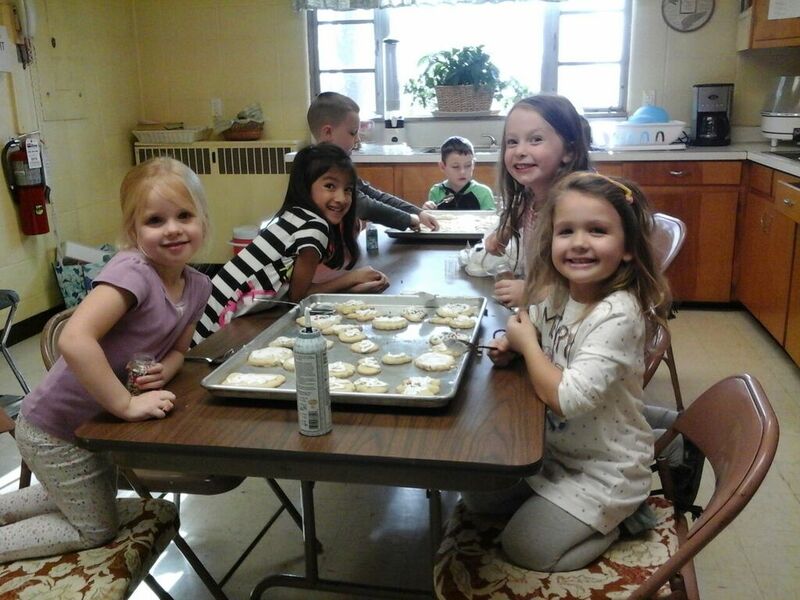 The third week we focused on learning about The First Thanksgiving, and preparing for our Thanksgiving feast. Everyday I read a special letter to the children from a pilgrim child. In these letters the children talked about their long journey on the Mayflower, the food they ate, hardships they experienced, feelings they felt, and games they played. The children really enjoyed learning that it took 102 days for the Mayflower to get to America. They also learned that only 16 men left the ship to see if the land was safe enough for everyone to come ashore. Throughout the week the children learned about the Native Americans and the pilgrims. We discussed who Squanto was and what he did for the pilgrims. The children also made girl and boy pilgrim hats for our feast! I wanted to say thank you for all of the parents who came and helped set up for the feast and who helped with the kiddos. The children really enjoyed sitting with their family and friends! The last week was all about dinosaurs! The first day we discussed the different dinosaurs such as Tyrannosaurus Rex, Briancosaurus, Stegosaurus, Apaosaurus and the Brontosaurus. We talked about their size, length, and what they ate! The next day the children learned about herbivores, carnivores, and omnivores. I explained to the children that a paleontologist can tell if the dinosaur was a meat eater or plant eater just by looking at the fossil print of their teeth. The children also loved hearing that herbivores had to eat certain rocks so that the plants could break down in their stomachs. Throughout the rest of the week we focused on fossil finding, the concept of extinction, and the time period dinosaurs came to be. 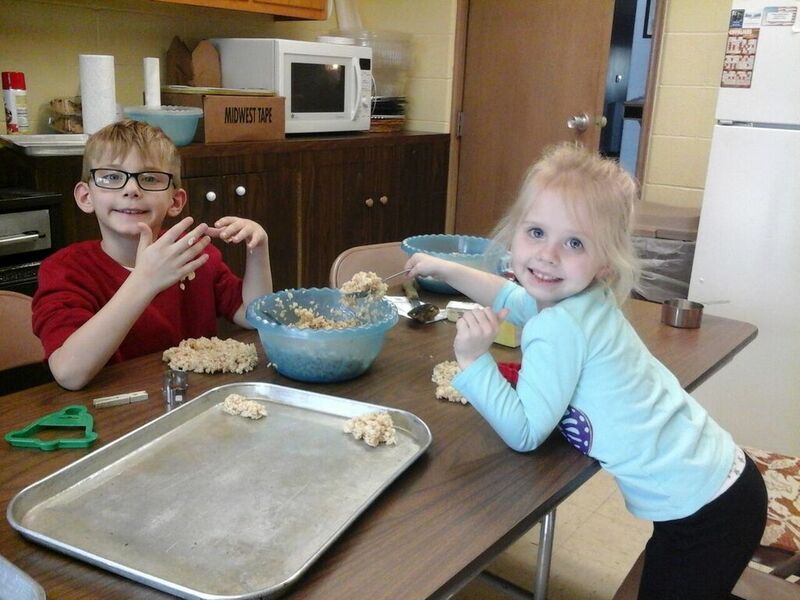 Our preschool friends had so much fun finding fossils, making fossil prints in cookie dough, reading amazing stories about them, and making a variety of Dinosaur crafts! 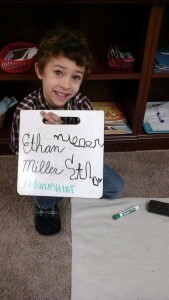 The kindergartners have learned how to tell time. We ended our section of telling time by learning how to tell time to the minute. 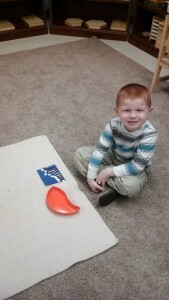 We have done many worksheets, use flashcards, and used a toy clock with movable hands to help us learn to tell time. Then we delved into everyone’s favorite thing…money. We learned about coins; what they look like and how much they are worth. 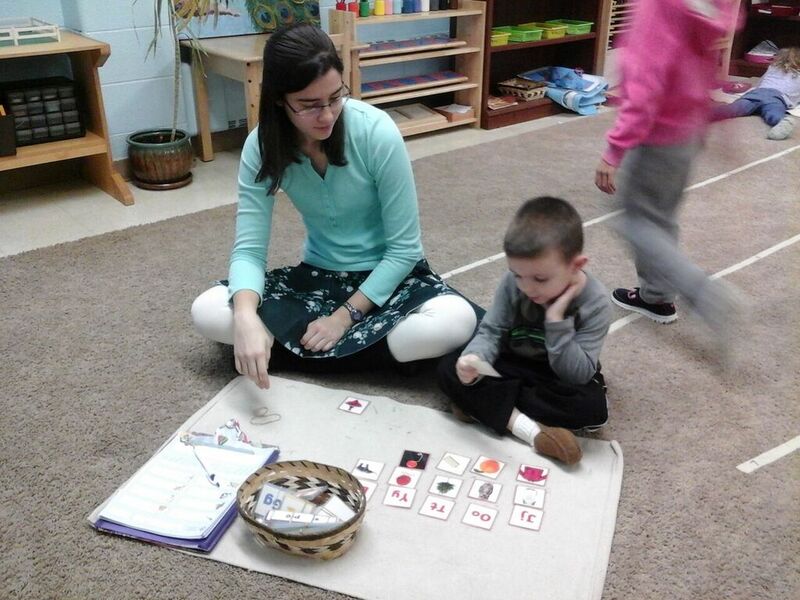 The kindergartners learned how to count coins when presented with multiple coins of different denominations. We went over bills including the ever elusive two dollar bill. 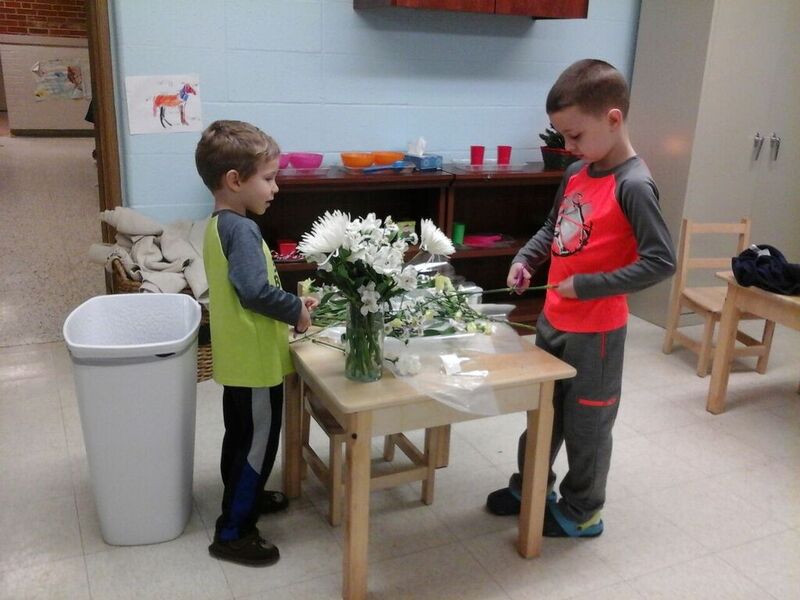 We ended November with learning the parts of plants, flowers, leaves. And learned about the parts and characteristics of the mammal, reptile, amphibian, bird, and fish. In music, the students got to practice their loud (forte) and soft (piano) voices to sing hello to Nemo the fish, Tina the turtle, and Allie the alligator! Then, we practiced playing egg shakers, listened to the triangle, and pretended to be on a “Christmas” train all at once. The children loved this song because they got to practice slow, medium, and fast speeds. 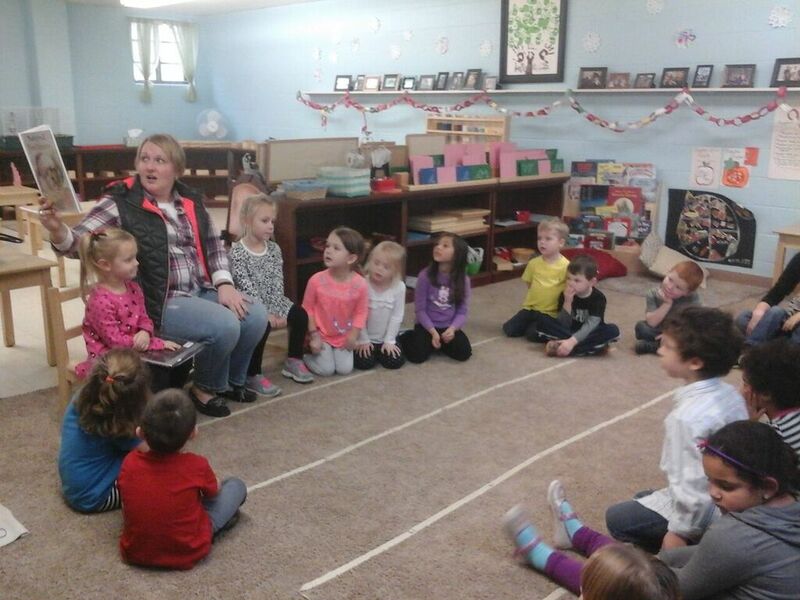 We also sang some other Christmas favorites like “Jingle Bells” and “Deck the Halls.” Ms. Lisa reviewed the whole, half, quarter, and eighth notes by having the children first identify the note and then clap the number of beats for each. 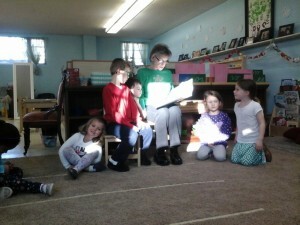 In addition to teaching us her fun music lessons, Ms. Lisa helped us with our Christmas songs for the show. Thanks Ms. Lisa! In science, our first experiment used play dough! Mr. John shaped half of the play dough into a bowl and the other half into a sphere. He asked the children which one would float and sink. We discovered that the sphere always sank and the bowl floated even though each contained the same amount of play dough. 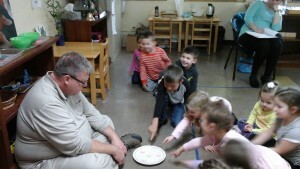 Mr. John explained that the bowl had more surface area which pushed the water away. In our next experiment we explored absorption with a diaper and paper towel. The children made hypotheses on which they thought would hold more water. We discovered that the diaper was able to absorb much more water than the paper towel after pouring water on each. The last experiment of the month involved skittles. Mr. John sorted skittles by color on a plate. He asked the children what they thought would happen when he poured water over the skittles. Many of the children said that the skittles would float. When the water was poured over the skittles, the dye off the candy started to run off. However, the colors did not mix! We learned that there is a wax on the candy that does not allow the water to mix the colors. 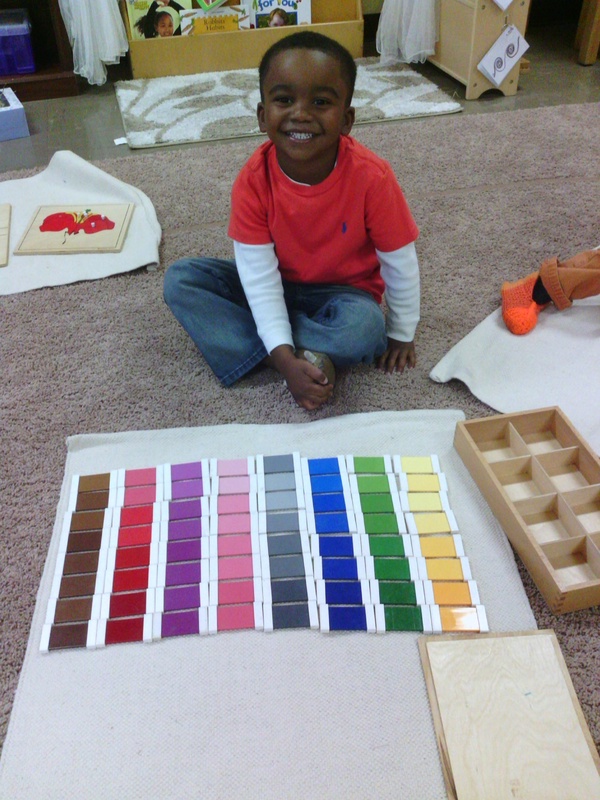 In Art Ms. Michele started with reviewing primary and secondary colors on the color wheel. Then she explained what complimentary colors were. (red/green, blue/orange, yellow/purple) Next the children did some drawing at the table with oil pastels. 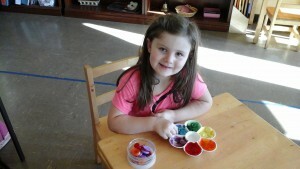 Ms. Michele had them draw lines on white paper with one color pastel. To finish the project, the students painted with the color compliment to the oil pastel they used to fill in the paper. To end the month, Ms. Michele did a leaf project. First the children drew a leaf on white paper with a pencil. Then they took a glue bottle and outlined the leaf drawn. (Ms. Michele told them “Just a line is fine.”) After the leaf was outlined in glue, the children took one color of yarn and placed it on top of the glue. To fill in the leaf, the children glued in warm (orange, yellow, red) and cool (purple, green, blue) color foam tiles to create a mosaic.